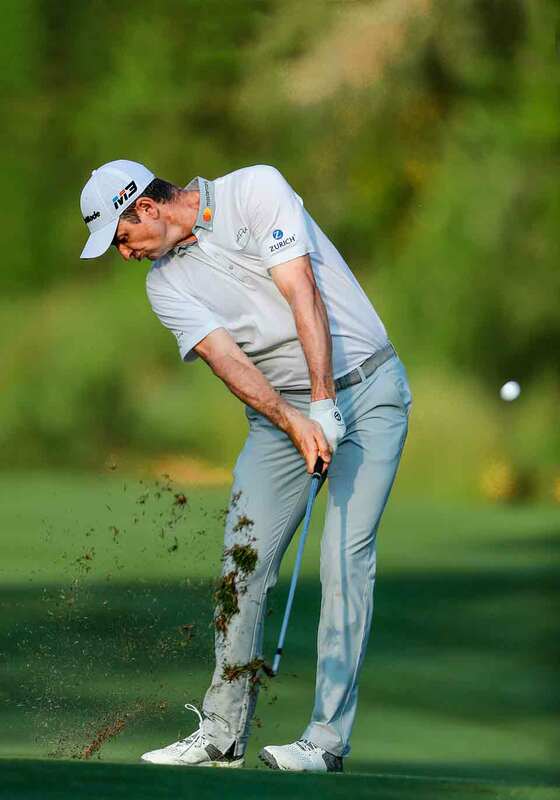 Justin Rose has always been a ballstriking savant, using pressure instead of raw muscle to compress the ball on every swing. It's a talent all great players share. Here's how to get it. Justin's arms appear to be pinned to his torso in the photo below, but a spilt-second from now they'll be flying off his chest and up over his left shoulder. Meanwhile, he's applying downward pressure into the grip with his right arm and hand while pulling up with his left side. This right/left battle is your ticket for speed. Notice the white in Rose's right index finger against the grip. There's a lot of pressure being applied to that joint, then through the handle and into the ball. No flip here, which is why JR compresses the ball while most recreational players simply swipe at it. Rosie's right side is just starting to bend as his left side gets stretched upward and behind his feet. At the same time, his chest is catching up and will soon rotate farther open than his lower body. This synchronized opening shows how Justin has effectively conducted the energy from the ground through his body and all the way to the clubhead. This is what calm, powerful footwork looks like. He moves into his left heel without much roll of his left ankle. The right foot applies pressure into the ground through the ball of the foot. Justin's pressure technique here is flawless. Copy it.